Note: BZ titled his post "March Madness, Israeli style" as if there were some other kind of March madness! (Ha ha! Poking fun at my own general ignorance of this whole NCAA thing. Don't worry, I get it. A bunch of college basketball teams, many of them very talented, are playing games against each other in some organized fashion. I understand that they do this every March. I think that UConn is a good team. I don't even know how I know that, but that's really all I know. 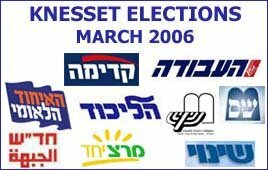 And you can still totally participate; a good first-order approximation is that the parties with seats in the current Knesset are most likely to win seats in the next Knesset.